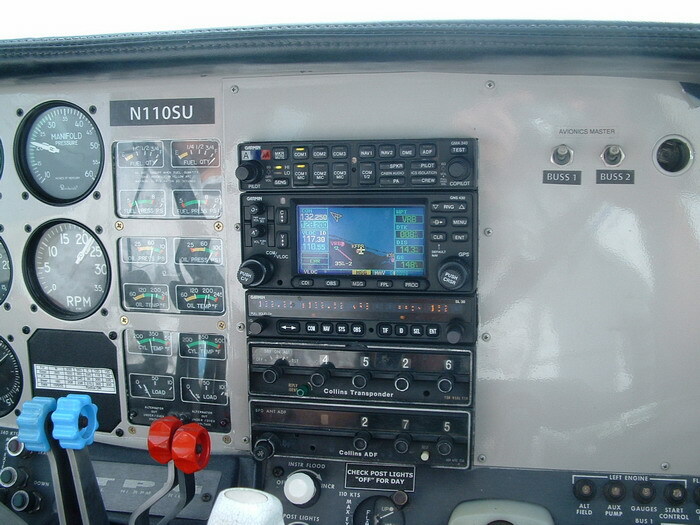 The Flight Instruments are all I get to see these days... This is taken while Taxiing. Lined up for take-off on Runway 27. 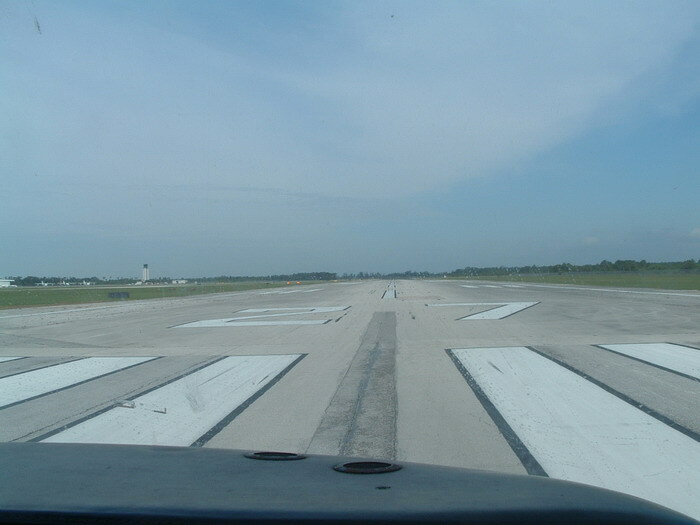 Passing Runway 14-32 at about 50ft on take-off. The airport housing is visible at the top right. The 'Comms Stack'. The GPS is showing us over Fort Pierce on our way to Vero Beach. This is taken in flight. Fort Pierce from the air. We have a new pet! 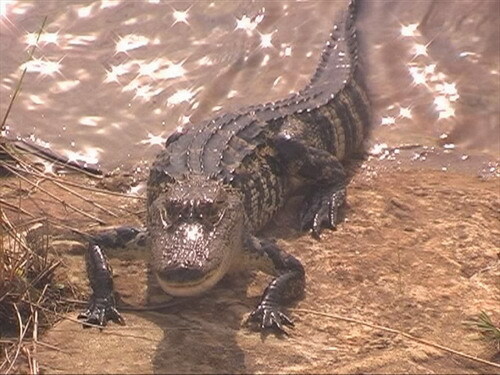 His name is Snappy and he's about 2 feet long. He lives in a pond about 50 yards from my front door. He really likes baloney and comes swimming over for food when called or when you touch the water... Just make sure you have some food! The picture links to a short video of feeding time! ANOTHER WEEK OF FLYING, IT'S A HARD LIFE! I'm currently sitting by the pool in the appartment complex, with an ice cold coke, working on my sunburn. I like wireless internet! I have been working, doing practise tests ready for my FAA written tomorrow. I'm not too worried about passing or failing, but I want to get a high score to hopefully make the oral quizing part of my checkride shorter. I've had some great flights this week. I finally flew and actually landed at an airport other than Fort Pierce on Tuesday. It was 'Space Coast Regional' at Titusville, very near to the NASA facility at Cape Canaveral. Apparently you have a great view of the shuttle construction building and launch pads, but we were in solid IMC for most of the way! At last some more actual instrument flying! It was a very smooth flight, apart from one grey cloud which got a bit bumpy. 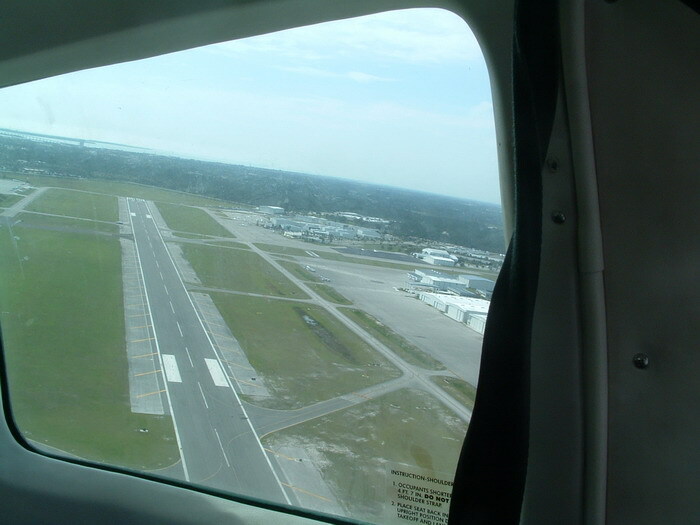 We shot the ILS, landed, then ducked into the FBO for a minute, then headed back to Fort Pierce for a localizer only approach (the glideslope is still out). Then on Wednesday we did the long cross-country flight thats required for the rating. We flew over to St Petersburg near to Tampa International. We did a VOR/DME approach there in very tightly controlled airspace, then took-off again towards Orlando Executive. Tampa ATC gave us radar vectors to fly right over the top of Tampa International at 3000 feet and my instructor let me take my foggles off for a quick peek. It's a huge and very busy airport, so it might seem strange that our little duchess was set right over it, but all the big planes are landing from one end and taking off at the other, so the air directly above is the most empty bit of sky around. We climbed up to 7000 feet for the flight over to Orlando, and with a hefty tailwind at one point we have a 176KT groundspeed. Thats 203mph! It was dark by the time we flew over Disney, but we could just make out the Epcot dome, before we were again routed directly over Orlando International and around to Orlando Exec. We stopped for a minute at an FBO there and I bought a coke at the machine before we flew back to Fort Pierce. Total time for the round-trip was 4 hours. A $760 Coke! That water is looking pretty good right now, maybe I'll go swimming.. It's a $155 (£85) Walmart special. Yes, I know it has a kickstand. 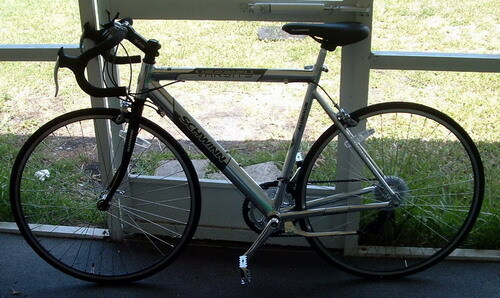 Since I don't have a car over here, and the nearest store is 4 miles away, I considered this a necessary evil. But it's actually kind of fun. I have tried to ride in the true 'British' style, deliberately obstructing traffic, but it's hard to do when most roads have at least two lanes and a 4ft wide strip of tarmac to the side. When it's a small road with only one lane, several minutes go by between cars, so they easily overtake me. I thought, briefly, about running red lights and relying on car drivers to break and swerve to avoid me, but the thought of a stereotypical soccer-mom piloting a 3 ton SUV was enough to discourage any attempts, and you are allowed to turn right on a red here anyway. Riding down pedestrians was another non-starter. There are no pavements (or sidewalks), and no pedestrians, they are all cruising past in air conditioned comfort. My sole consolation is that I have been too cheap to pay the $8 for a set of lights. But then, it doesn't get dark until after 9, so I haven't had a chance to ride at night. I've had some interesting flights over the last week. We had a fantastic night flight up to Melbourne for more ILS approaches, the first of which was pretty interesting. The runway in use was runway 27L but the ILS was only for runway 9R, which is the other end of the same runway. Since we were only doing an approach and turning away at the threshold instead of landing, they allowed us to do it, while a regional jet was simultaneously doing a visual approach (and actual landing) at the other end of the runway! I've also been up to Titusville, where the controller in the tower was a very nice man with a very coarse Souther accent (Y'all come back now, ya'hear?). The stage check didn't go as well as the night flight beforehand, mainly because it was in the middle of the afternoon and it was very convective. It's very easy to maintain your altitude within 100ft when the air is very smooth at night, but when you are flying from 500ft per minute downdraft to 500ft per minute updraft, it gets much harder. But I managed to fly the approaches correctly so I am on to stage III which is the final part. At this point I just about know all of the syllabus, I just need to get more practise and to work on things like maintaining that altitude. Hopefully tomorrow I will be flying a long cross-county flight that is one of the requirements for the rating. I'm planning to fly to St Petersberg (Tampa) then to Orlando Executive, and back to Fort Pierce. The route takes in some busy airspace close to Tampa International and Orlando (MCO), so it should be a good experience. And the route goes over Disneyworld! I've been making some real progress in the last week or so, learning to fly holding patterns and I've just started shooting full approaches. For what it really just a big circle in the sky, a holding pattern is far too complicated. It's more of a racetrack pattern, with the home straight being flown in a specific direction on to a specific point. It's actually not that hard, but I see why people can get confused, especially when working out which manouver to fly to enter the procedure depending on the direction you approach it from. I had my first flight on an IFR flight plan today, which my instructor filed. 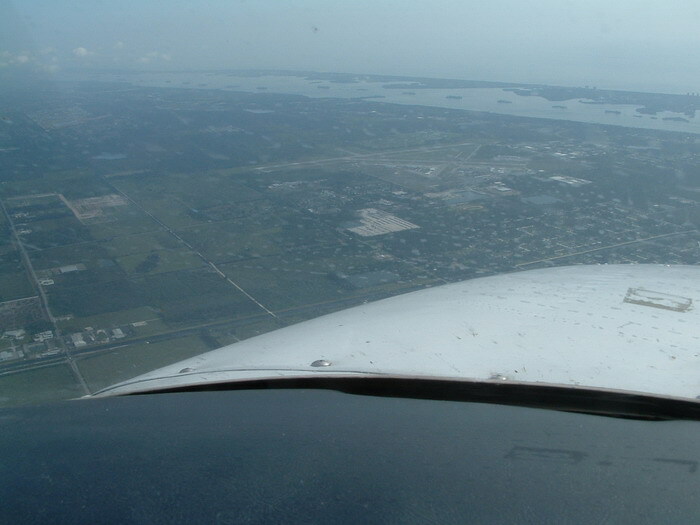 We flew from Fort Pierce up to Vero Beach on radar vectors given to us by Miami Center, then flew a low approach on the VOR/DME Approach to Runway 11R, went missed and were vectored around for another go, before heading back to Fort Pierce to fly the ILS to runway 9. The glideslope and DME were inoperative, so we flew the localizer only before circling to land on runway 14. I really like instrument flying. It's so precise, you follow an assigned route, so you can always tell where you are, you always have a heading to fly, and you should always end up where you want to be. It's so much more precise than VFR flight. Tomorrow I shall be flying a very similar route, but this time hopefully I'll get to start talking to Miami center, which adds a huge amount to the workload. I've had a really good days flying today, everything worked out really well for me. My first flight was at 7am, so my walk over to the flight school was in the dark. The airport just looks fantastic at this time of day, covered in a thousand blue taxi-way lights. The weather was perfect with the ATIS (The Automated Terminal Information Service) reporting calm winds for the first time since I've been here. We took off, and after a quick review of the manouvers my instructor told me to intercept the 330 radial for Vero Beach VOR. I'd already tuned in the navigation radio to this so all very straight forward and something I remembered from my PPL. Then we did something new, a DME arc. DME gives you a slant range distance from a transmitter, and a DME Arc means flying around the beacon in a circle or part of a circle maintaining the same distance from it. My instructor showed me a very straight-forward technique, basically flying between 10 degree radials and adjusting heading by 10 degrees each time. It works perfectly on a calm day like today! Then it was flying to a NDB which is another type of navigational beacon. The last part of the flight was intercepting a localizer for the return to Fort Pierce. The localizer is similar to a VOR in the way it is intercepted but it is more precise, and is only followed in one direction, (unless you are flying the backcourse). It gives horizontal guidence for the approach to an airport, sometimes with a glideslope to provide vertical guidence. The glideslope at Fort Pierce is currently out of service (another piece of information ATIS gives me every morning!) so my instructor told me to which altitude to descend to as I followed the localizer. When he told me to take the foggles off and look outside, it was fantastic to see runway 9 stretched out ahead of me about a mile away, perfectly lined up for a landing. We actually had to land on runway 32, but it was still good. I finished that flight with possibly the best visual approach I've flown in the Duchess. It's great to have a day of still wind! My Stage Check was this afternoon with the chief pilot. I flew very well, and he commented on how much smoother my flying was. We did the same manouvers, and then he pulled circuit breakers to make some of my instruments fail and had me do some turns and then pulled a mixture stopping one of the engines. We did another intercept of the Vero Beach VOR and a DME arc in the other diection from the morning flight and then back to Fort Pierce. On days like today when everything just works out, I know why I'm here! For the last week I've been working towards my instrument rating. I take off, get to about 1000ft on climbout and my instructor hands me the 'foggles', glasses designed to block my view out of the windows and only let me see the instruments. Then we fly out over the ocean (I assume, since we go east, I can't see it!) to fly basically the same manouvers I did for my multi-private, but with only reference to the instruments. I actually find it far easier than I was expecting, maybe because I've been paying so much attention to my instruments anyway trying to maintain that exact altitude through the manouvers, it's much the same. 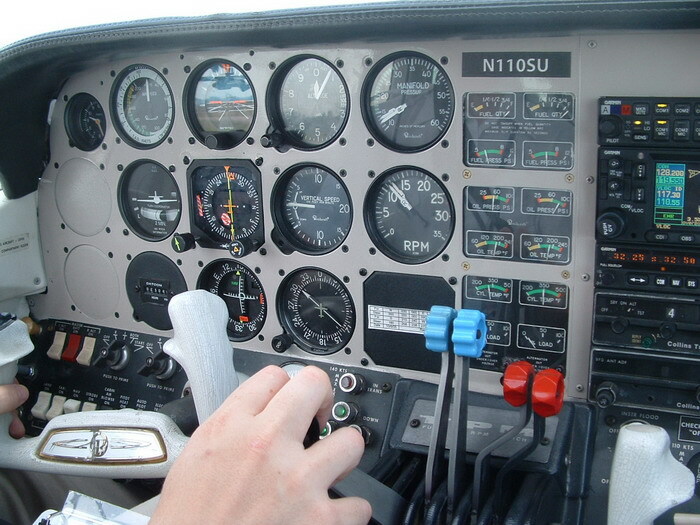 There are some extra parts as well, like timed turns, flying on a partial panel (simulating failure of an instrument or group of instruments, as might happen with a power failure or gyro-pressure failure). We also did some navigation today, basically the same intercepting a VOR just the same as on my single-engine private. Now I'm just looking forward to shooting approaches! Today has been a very long day. I met my examiner at 8am to start the oral. I remember being told the oral should only last 45 minutes. Mine lasted two and a half hours! I'm glad a read way too much about the systems the Duchess has. Imagine going for a drivers licence and having to know if you have an electrical or mechanical fuel pump, what the ratios in your gear box are, what the heat output of your heater is and what suspension configuration you have... Then add aerodynamics questions. After that ordeal was completed the flight part was a relief. OK, maybe not. I'm really pleased with how well I flew those manouvers. All that practise really paid off. The only thing I had a problem with was the steep turns. As I rolled into the first 360 degree turn to the left, my door popped open. There are a few aircraft here where the door pops open on almost every flight and this was one of them. It's not dangerous, but it is very distracting, and I couldn't hold the altitude within the required 100ft. I rolled out after 180 degrees and tried again, and eventually got it on my third attempt, before reversing to a perfect right 360. I'm told if you don't complete a manouver you can't be failed on it, and it worked! Then it was back to the traffic pattern for normal, short field and single engine landings. This was the serious difference of opinion I had with my examiner. My idea of a short field landing, is a landing right on the numbers, with maximum breaking effectiveness, simulating the kind of landing you would have to do on a very short runway. This opinion is shared by my instructor, the chief pilot and everyone else I've asked. I have this kind of landing nailed. A steep approach at 75KTs, touching down with the main gear on the paint of the upper part of the '9' on the end of the runway. My examiners opinion is that this is a simulation of a 50ft obstacle (The FAA DOES like those!) at the end of the runway, forcing you to land further down at the 1000ft markers. I had to repeat this part to his requirements, but all I really need is a point to aim for! The single engine landing also went well. I was a little low on base, added power and ended up a little high on final. Not a perfect touchdown, but safe and not uncomfortable, so a pass! I'm now qualified to fly multi-engine aircraft as well! Bring on instrument training! I have my FAA checkride scheduled for tomorrow, for my Private Pilot Multi-Engine Land rating. I had a last flight with my instructor today and I'm really pleased. It's really started to work out for me this last week. I guess I'm 'catching up with the airplane'! If I can fly those manouvers as well tomorrow as I did today I should pass. I'm meeting my instructor this evening to go over the knowledge part ready for the oral. Theres not too much stuff, compared to the PPL, mainly quizzing on the different systems the duchess has, like the landing gear and the constant speed props.